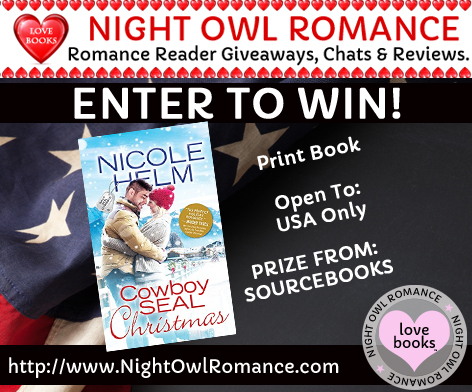 Today I've got Nicole Helm stopping over to share the guys from her Navy SEAL Cowboys series. The third book just released. I love the cover of this Christmas romance. It's so scenic and they are such a cute couple. From the cover I can tell it's not a Texas based cowboy romance as just look at all the wonderful white powdery snow. We got a bit of that last year here in San Antonio, Texas last year... but that was a 30 year event. It only lasted a day :(. Don't miss out on the romance book giveaway below. We have a print copy to give away to a lucky romance reader. And here we have Nicole Helm. Who are these three former SEALs? Alex Maguire: Alex’s nickname in the Navy was ‘Dad’—and that nickname tells us a lot about Alex. A natural leader, Alex feels somewhat responsible for everyone. It was his idea to bring his wounded friends back home to the Montana ranch he grew up on, and he considers himself the leader—not just of Gabe and Jack, who were injured in the same attack he was, but of Becca, the step-sister who inherited half of his ranch when his father died. Alex is a hard worker, and he believes strongly in right and wrong. Taking care of the people under his protection is always right, or so he thinks. The problem is, he’s not much on being taken care of, and it’s the one thing he desperately needs. And it may be just what he finds in COWBOY SEAL HOMECOMING. Jack Armstrong: If you think you’ve had the worst day ever, take a seat. Jack was not only seriously wounded in a grenade attack last year, but it happened right after he got the call from his father that his fiancé was marrying his brother…because she was pregnant with his brother’s baby. Not eager to go home and face his ex-fiancé or his new nephew, especially when wounded, Jack figures heading the 1,500 miles from home to Blue Valley, Montana is just what he needs. Suffering physically from his injuries as well as PTSD, Jack needs a lot more than distance, but what he finds at Revival Ranch is a home and a family of his own choosing in COWBOY SEAL REDEMPTION. Gabe Cortez: If you asked anyone in Blue Valley to describe Gabe they would say ‘funny’ and ‘charming’ and maybe even ‘cheerful.’ Of course, those who really know him realize it’s a mask, but what is it hiding? Gabe’s traumatic childhood led him to join the navy, where he promptly moved up the ranks. He planned on being a career military man—until he was injured and removed from active duty. Not moving to Montana and doing ranch work, but Alex and Jack are his brothers. Watching them deal with their PTSD, fall in love, and build new foundations makes Gabe feel like the odd man out once again. Until a Christmas miracle shows him just what love is all about in COWBOY SEAL CHRISTMAS. It will take three very special women to help heal the scarred hearts of this former SEAL trio. Luckily, I know just the three women to do it.